SIMPLYA VIDEO is the new exclusive Wi-Fi touch screen keypad 9,6” compatible with control panels Amica, Elisa, Eva and Wilma. Thanks to its elegant and ultra-flat design, it is adapt for any kind of environment. The efficiency of the modern graphic interface allows an intuitive management of all Anti-theft, Video surveillance and Home automation functions. Simply by touching the icons (i.e. anti-theft, lights, commands, macros, etc.) it is possible to carry out different operations as arming/disarming single areas of the system, bypassing/unbypassing the zones, activating/deactivating commands as lights/rolling shutters and macros, viewing cameras etc..
To further simplify daily operations, the page graphics can be customized by creating some keys to quick access the functions through command keys and macros. 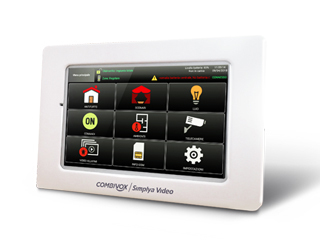 SIMPLYA VIDEO is also a monitor for the continuous visualization of up to 8 IP cameras and of an embedded camera (Home Camera), that can be associated to alarm zones, for the sending of video alarms. This keypad has the exclusive function of creating video-alarms on event (alarm and tampering of one or more zones) with or without 10-sec pre-recording and of post-recording up to 30 sec. All video-alarms are stored in an internal memory and sent as e-mail attachments. Smartweb interface and Combivox Wi-Fi Wan module are necessary in order to install and connect Simplya Video keypad to the control panel.